Additionally, late yesterday the White Sox agreed to contract terms with Adam Dunn in a reported 4-year, $56M deal. The sticking point between the Nats and Dunn was believed to be the 4th year in the contract, which the Nats didn’t want to give Dunn. It’s frustrating to watch the Nationals struggle each and every off-season to do the right thing when it comes to contracts and acquisitions, and it seems that 2011 will be like each of the previous years: disappointing. The Nats have practically zero chance at signing Cliff Lee, and of the remaining free agents, there will be significant high-dollar competition, something the Nats have been averse to in the past, and given the result of Dunn in Chicago, I wouldn’t expect that to be changing. 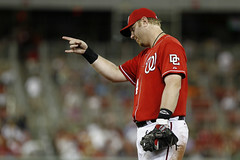 So who will play first base for the Nationals in 2011? Some say Carlos Pena, while most of us are just shrugging and saying, “Damned if I could tell you.” The Nationals are not deep at the position, and don’t have an every-day first baseman at the Major League level, but could convert someone to the position. Derek Jeter’s still looking for work, and it’s always possible that if the Yankees don’t agree to a contract with their captain, he could find work just a bit further south and across the diamond here in Washington.